Desalination is the process of removing the salt from seawater or salt-laden groundwater so that it can be used for drinking, agriculture, and industrial purposes. There are several desalination technologies currently in use, but they all require large quantities of energy to produce usable water, making the water very expensive to produce. There are two main approaches to desalination: reverse osmosis (a filtration method) and multi-stage flash (a distillation method). This method involves forcing the water through a membrane with microscopic pores that are large enough to allow water molecules to pass through, but are too small for salt particles to pass through. There are several stages involved in the process. Pretreatment uses various methods (sedimentation, coagulation, etc.) to remove suspended solids, bacteria, and any other form of contamination that would clog the membrane. High pressure pumps (ranging from 150 psi for brackish water with low salt content to 1000 psi for seawater) force the water through a membrane composed of composite polymers and into a central collecting tube. Post treatment may involve adjusting the pH of the water and disinfecting it before it is released into the municipal water supply. Reverse osmosis is very effective at removing salt -- nearly 100% -- but also removes other healthy minerals from the water. One drawback is that pesticides, herbicides, and other toxic chemicals can easily pass through the membrane, requiring an additional treatment process to remove them from the water. Heating salty water to the point where it vaporizes into steam leaves the salt particles behind, resulting in pure, drinkable water when the steam is cooled and condenses back into a liquid form. 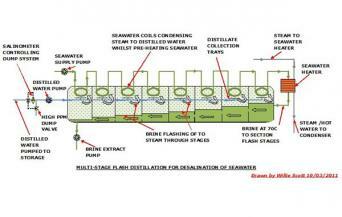 Multi-stage flash distillation is a technology used to efficiently distill saltwater on a large scale. It, too, is a multi-stage process. The water is heated under very high pressure and then released into a chamber where the pressure dissipates, causing the water to boil instantly. A heat exchanger (cooled by another water source) is used to condense the evaporated steam. The process is repeated again and again with the remaining water to recover as much of it as possible. This distillation process can be repeated up to 25 times (stages), but eventually the water becomes too laden with salt and is discarded. The extremely salty waste water is also highly corrosive to the metal components of the system, making it necessary to use expensive stainless steel throughout the desalination plant. There are numerous other types of desalination, but they all fall under one of the two main categories of either filtration or distillation. Each is an attempt to improve on one of the primary methods listed above in an effort to make it more efficient, cost-effective, and less energy intensive. Multi-effect distillation is a low-pressure, low-temperature approach where the salt water passes through multiple chambers that each remove a little more clean water, as with the multi-stage flash distillation process. These plants make use of the fact that the lower the water pressure is, the lower its boiling point - thus each stage (or effect) requires a lower temperature, and thus less energy to convert the water to vapor. Multi-effect distillation is often used in conjunction with vapor compression distillation, an approach that uses vacuum pumps to compress the water vapor, thereby increasing its temperature and reducing the need for an external heat source. 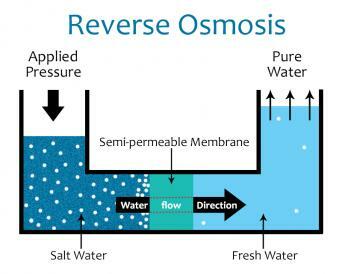 There are several alternatives to reverse osmosis, some of which are new and emerging technologies. Forward osmosis is a low-pressure system where the water drips through a special type of filter that changes the molecular structure of the salt into a form that can be removed with minimal heat input. Carbon nanotubes is an approach that uses an electric charge at each of the tiny pore spaces in the filtration membrane that effectively repel the salt molecules, but allow the water molecules to flow through. Biomimetics also involves an electric charge in the membrane, but the pore spaces are designed with proteins that mimic the pore spaces that allow water molecules to move in and out of living cells. 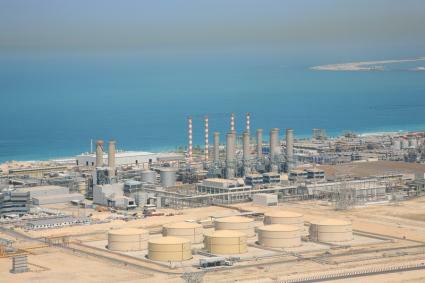 Desalination plants were first developed in dry coastal areas where there is access to seawater, but little freshwater available, such as the Middle East. However, as global populations have increased and sources of clean freshwater have decreased, desalination has become more and more common - as of 2010 there were approximately 14,500 desalination plants across the planet. Desalination addresses the environmental problem of freshwater scarcity, but its reliance on complex technology makes it too expensive for widespread use except in areas that have acute water scarcity. Unfortunately, the highly concentrated saltwater by product of desalination creates an environmental problem of its own when it is released into the environment.